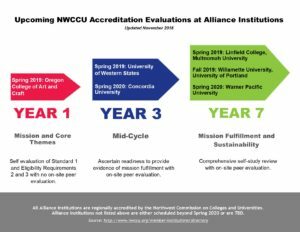 Please click on the image above to view an updated graphic depicting the upcoming Northwest Commission on Colleges and Universities (NWCCU) evaluations at Alliance institutions. Congratulations to the administrators, faculty, and staff of Corban University, Lewis & Clark College, Reed College, and the Pacific Northwest College of Art for their diligence and dedication preparing for and hosting their NWCCU evaluation visits this Fall! We also wish the accreditation teams at the Oregon College of Art and Craft, the University of Western States, Linfield College, and Multnomah University all the best as they prepare for their visits in Spring 2019.